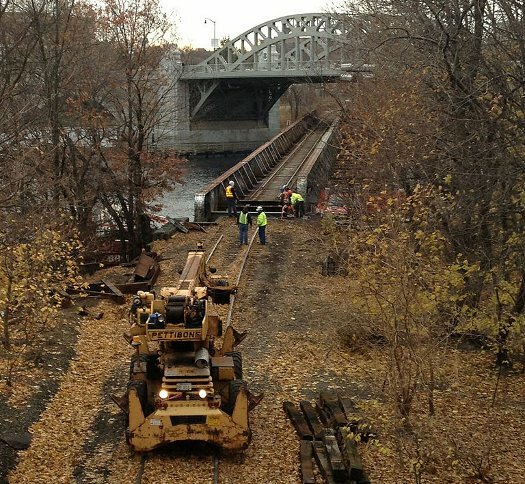 ^ the Boston University Bridge, seen here under repair in 2012, is the only current rail link between North of Boston and South of Boston. Will we build an actual connector ? If Governor Baker thought that securing his MBTA reform bill was the end of his transportation wars, he now knows differently. About a week ago a revived fight to build a North Station to South Station connector rail hit prime time, and yesterday came news that the Green Line expansion to Somerville and Medford might cost at least $ 1 billion more than anticipated — a stunning number. So what does Baker do now ? He cannot set either one aside, as he was able to do with the Boston Olympics bid. The Olympics Bid was a trial balloon; Boston’s economy and social life may hurt without the Games, but only temporarily. Not so with Green Line expansion or the North-South rail connector. Dismissing either will impact our region’s transportation for many decades. That’s not to say that the decision to go ahead with either project is easy. Still, the two are not equal. The North to South rail connector remains conceptual, while Green Line expansion has reached the build-out point. 1, Green Line expansion should continue, even if the contract price can’t be brought into line with the engineer’s projections. The Feds have committed $ 1 billion to the project; it would be foolish to lose that.The City of Somerville needs the Green Line. So does Medford. Communities farther up Route 38 can use it. So can people who now pack I-93 to overflow at rush hour. If we’re serious about decreasing vehicle traffic — and carbon emissions — Green Line expansion must be finished, as soon as feasible. So I repeat: it should be done even if there’s a substantial cost overrun. Two problems portend. First, a Green Line cost overrun means making hard decisions about repairing existing MBTA tracks, equipment, signals, and trains. These can NOT be put off, which means applying state monies currently slated to other state agencies. (DO I hear DCF reform ?) Second, anyone who has attended public meetings concerning Green Line expansion has seen the nitpicking and design unrealities that always get pushed into the mix. Green Line expansion cannot be finished anywhere close to budget if it takes on every bell and whistle desired by those who show up at public meetings. That said, extension of the Green Line has already consequenced development in Somerville and the city’s entire economy. It can’t be set aside. 2. The North Station to South Station connection looks daunting. Certainly Baker should require thorough cost and engineering analysis of the project before deciding anything. Digging a tunnel between the two stations means going very deep under immense structures. If you thought the Big Dig was an engineering nightmare 25 years ago, imagine what will be needed to tunnel under buildings vastly taller than those of 1990; under sewer lines, subway tunnels, and the depressed Central; Artery itself. It also might require relocating South Station and its current ten rail portals, because, imagining potential connector routes, I can’t see how it gets from North Station to South Station otherwise. The easiest route would be to underride Atlantic Avenue. Sixty years ago that roadway included train tracks of a connector railroad. I recall those trains : they were surface vehicles. Today’s connector would have to tunnel under the already very deep Blue Line tunnel — and under the Red Line tunnel, which, quite inconveniently, runs directly alongside South Station. How would the connector tunnel rise up steeply enough to go from under the Red Line to a surface connection with South Station’s ten rail portals ? Perhaps a connector line could run alongside the Orange Line from North Station to Downtown Crossing, thence alongside the\ Red Line to South Station ? This too would be an engineering nightmare and a budget buster, and you’d still have the rise to surface problem, at both ends of the connection. Lastly, what happens to the $ 1.6 billion expansion of South Station, planning for which is nigh complete, awaiting only agreement to move the Boston Post office ? Do we roll this project into the connector proposal and thereby delay it, even kill it ? Advocates for building the connector speak passionately and hurl a blizzard of answers at you, to questions you ask — and to those you haven’t asked yet. Which only ratchets my skepticism up. Not skepticism for the idea. I support the concept. Why our city lacks a rail pass through, I’ll never understand. Lacking a connector forces cars onto the Central Artery which that groaning roadway can barely manage — and at rush hours, cannot. Someday the rail connector ought be built. I’m just not sure that now is the right time, given the huge dollar demands faced immediately by the MBTA, commuter rail, bridges and roadbeds. On September 9th, Baker meets with the connector rails’ two most potent advocates : former Governors Dukakis and Weld. That should be quite the dust-up. Let’s see what comes of it. NOTE : this story has been UPDATED as of 08.26.15 at 10.05 AM in light of what we now know about the economicsof Green Line extension. As an architect who served on the original Task Force that evaluated the North South Rail Link in the early 1990’s and then served on a citizens oversight committee for the eight year study that followed, I appreciated your coverage of the project yesterday. I thought it might be helpful to try to address your many good questions. Please let me know if I have failed to do this, or have fallen into the trap of “hurling a blizzard of answers”! (I hope not). A: Both are valuable projects. Arguably, because rail unification transforms our entire regional rail system, the Rail Link is particularly vital. The failure of the Commonwealth to learn from the Big Dig fiasco continues to cast a shadow over all new infrastructure projects, and rightly so. We need to understand what went wrong and learn from our mistakes, so we can proceed again with confidence to address our many pressing needs. Encouragingly, cities around the world are building rail links very similar to our own NSRL project, and completing them at affordable prices, scarcely higher than our own proposed terminal expansion projects. A: Absolutely. The Legislature included $2M in the 2014 Transportation Bond Bill for this purpose. A: The current alignment, largely below the Central Artery, was chosen specifically to avoid tunneling below existing buildings. This alignment also minimizes utilities conflicts (most of which have already been relocated in this area anyway). Having said that, new construction along the Artery corridor, and on certain air-rights sites does threaten the project. Recent construction in Bulfinch Triangle (near North Station) will have to be evaluated for potential impacts, but this is not high-rise construction. The best way to “preserve the option” is to move ahead with the project. A: While the project does extend below the Artery, and several subway tunnels, this is not problematic for Tunnel Boring Machines and is actually a simplification, since the Artery is public property. The only tall building that could be impacted by this project is the proposed 23 story tower on the Hook Lobster site, which has not yet been permitted. NSRL tunnels would enter the Artery corricor below this site. The Globe and others have cautioned the BRA to assure than any construction on this currently undeveloped site be duly coordinated with the NSRL to avoid potential costs or conflicts. A: A new station will be built adjacent to South Station, and at a lower level, with escalator connections to the Red and Silver Lines. The tunnels then enter the Artery corridor and run north, making connections to the Blue, Green and Orange Lines. From there the link runs under the Charles River, connecting to all of the northside commuter rail lines. While some trains will continue to use the surface platforms at South Station, most will run through the city via the new lower level station. A: A primary goal of the NSRL project is not just to connect our northern and southern rail lines, but also to connect them to every subway line, to provide truly integrated and convenient regional transportation system. Only by doing this will we fully realize the potential of our region and provide a convenient alternative to cars. An alignment running along the waterfront, below Atlantic Ave, in addition to being indirect, has the drawback that it would bypass the Orange and Green Lines, and provide very poor pedestrian access to important parts of the city. A: The depth of the Blue and Red Line tunnels is not problematic. New and attractive stations would be built below these systems with escalator connections to them and to the surface, similar to Dupont Circle in Washington DC and Westminster Station in London. A: SSX, despite the large sums invested in it thus far, is a white elephant that provides only marginal benefit. The only reason we need more platforms at South Station is that trains have to back out of the station to allow another to enter. A through-connection unlocks far greater capacity. This is the difference between carrying water with a single bucket vs. using a pipe. Worse still, SSX is an obstacle to more sensible and enlightened rail development. Terminal stations require large layover facilities nearby, severely compromising more productive uses for prime urban land. Widett Circle, for example, will be much more valuable if a parking lot for 30 trains is not built there. We will be served far better by redirecting the $1.6B cost of this project, and the several hundred million more needed at North Station, to building a rail connector that provides more capacity, eliminates acres of rail yards, and allows the entire region to function as an efficient and sustainable whole. A: The issues are complex to be sure, but warrant careful and deliberate review, given the long term impact. A: An efficient rail system will pay for itself, provided the value it creates is properly captured. Our currently fragmented system is not sustainable, and does not provide efficient and equitable access to our regional labor, employment and housing resources, nor position us to compete effectively in decades to come. Thank you for your extended and detailed comment, Brad. It follows almost exactly the script that John Businger read to me on the phone tgwo days ago at top speed. I remain skeptical of the N-S Connector, am quite nonplussed by your concept of connecting it to all the subway lines, and disagree, sol far, that we should not expand South Station.